This blog was written by the community of Tambo Square in Mfuleni, Cape Town, namely: Babalwa Sabe, Nomaphelo Voyi, Nosikolise Swaphi,Asanda Kumbaca,Nokubonga Stefans,Lindiswa Lufefe,Ntandazo Mtshonono, Yoliswa Tsono,Tabisa Matiwane,Stutu Yamani,Nolusindiso Zakaza,Nomaphelo Zakaza,Ayanda Langa,Vangeliswa Sobamba,Phindile Faro and Nkosikhona Bangiso. This is the third blog in the Alliance’s Community Voices series. Community Voices shares community-narrated experiences that highlight the value of a people-led approach that is underpinned by an organised community structure. For the Alliance, a people-centred approach is crucial for building collaborative partnerships between local governments, informal settlement dwellers and other stakeholders. Through a series of workshops of collaborative documentation and story-telling, FEDUP and ISN members, with the support of CORC’s documentation team, produce community-generated documentation, as part of elevating the voice of the urban poor. Tambo Square is situated in Tokwana Street and lies adjacent to the Sandra Child Centre in Extension 6 of Mfuleni. The 1846m² land size holds 60 households with a population of 119 people. As residents of Tambo Square, we had different reasons for moving to the open space which is now called Tambo Square. Some of us were backyarders. When we saw an open space and decided to occupy it, some moved out from our surrounding family and saw a vacant land and occupied it. Others couldn’t afford renting anymore. When we saw people occupying the space, we then decided to join. 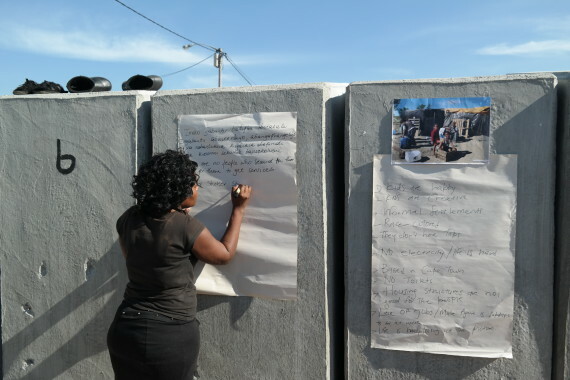 In 2008 the City’s anti -land invasion unit demolished our structures, But residents didn’t give up and we decided to build our structures again. Our biggest challenge is not having electricity. We need to find money every month to be able to connect illegally from the surrounding formal houses. We spend almost R500 just to get our tap connected. The toilets are far for some of the residents and we have to walk quite a distance to access it. During night time or winter season we fear using them because the crime rate in Mfuleni is quite high. We feel that our settlement would be much neater if we had dust bins to throw our unwanted materials. Since we don’t have bins we now have rats due to people throwing dirt wherever they see a space. This is a health hazard for us. Our settlement is dense, this makes it harder for emergency vehicles to come and help during time of need. If we can catch fire all our shacks would burn in the blaze. Another problem is because of the density of the area, criminals find it easy to do robberies here because one will not know where they went. In October 2014, we decided to seek help in trying to better our living conditions since we didn’t have any basic services. 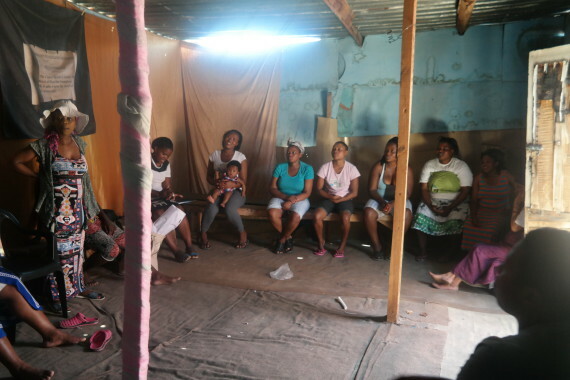 This is when we met the Informal Settlement Network (ISN). The community approached Western Cape ISN Coordinator, Nkokheli Ncambele, who introduced the community to the SA SDI Alliance. ISN introduced us to the Alliance tools which meant we had to do community-led profiling and enumerations with the support of the CORC technical team. 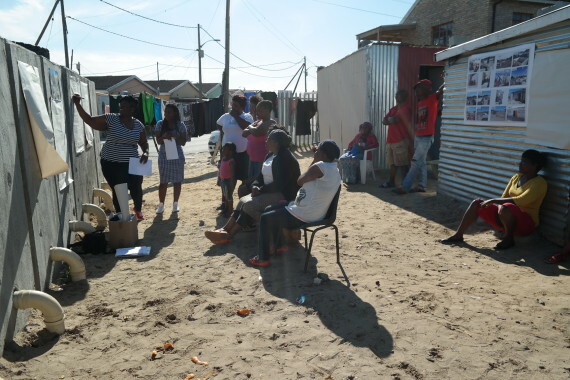 A group of us went on an exchange to Flamingo Crescent to learn about informal settlement upgrading & reblocking. 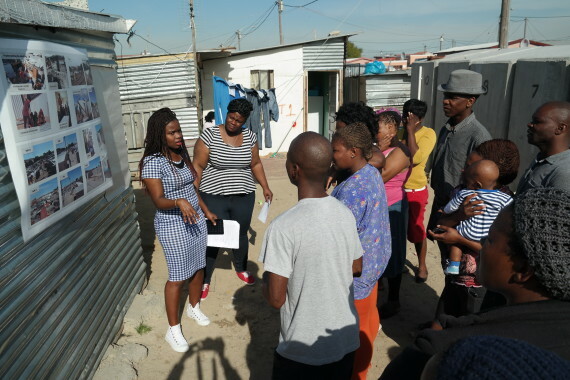 By June 2015 our community leaders had already partnered with ISN, the SA SDI Alliance and the City of Cape Town for 10 toilets and 5 water stands.This was a victory for us. At first the City said that Tambo Square is too dense for services. 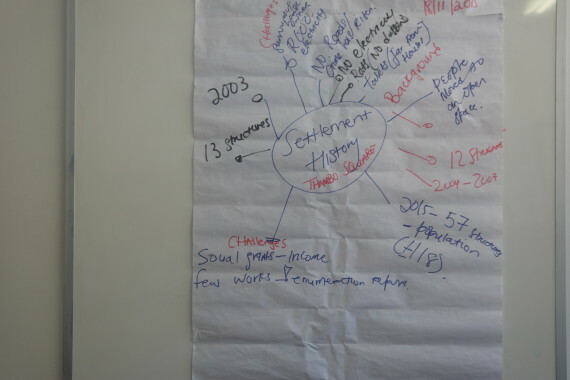 ISN suggested that we move a large container that was standing in front of our settlement to make space for services. When we presented this to the City their response changed and they agreed (read blog on water and sanitation here). Through its partnership with ISN and the City of Cape Town, Tambo Square is set for upgrading and reblocking in February 2016, which will enable 1:1 service installation. 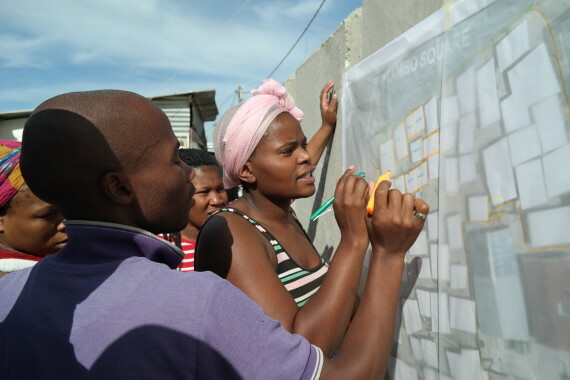 The upgrading of Tambo Square is activating a more nuanced and community-led approach. The partnership between Tambo Square, the Alliance and the City draws on organised community (leadership) structures. These activate community- based savings, data collection and joint partnership meetings with City officials and the Alliance throughout project preparation and implementation.